Hemet police said a box of Girl Scout cookies aided in the arrest of 31-year-old Joseph Kopff for felony reckless evading on Thursday, Feb. 4, 2016. HEMET, CA -- Police in California are crediting Girl Scout cookies with helping them nab a suspect who led officers on a pursuit. Hemet police said officers attempted to stop a motorcyclist in the 1300 block of East Florida Avenue at about 4 p.m. on Thursday. That's when officials said the motorcyclists took off, leading officers on a short pursuit. While they were chasing the motorcycle, police said the rider threw something into the bushes just prior to officers losing sight of him. Officers received a tip that the motorcyclist had pulled into a mobile home park in the 600 block of North State Street and said they found the motorcycle under a tarp with smoke emitting from it. Police searched the bushes where they said the pursuit suspect had tossed an item. Officials said inside the bushes they found a box of Girl Scout cookies with a note and phone number to call if the buyer wanted to purchase more. Officers called the number listed on the note and the sales representative confirmed a box of Girl Scout cookies was just sold to a motorcyclist. 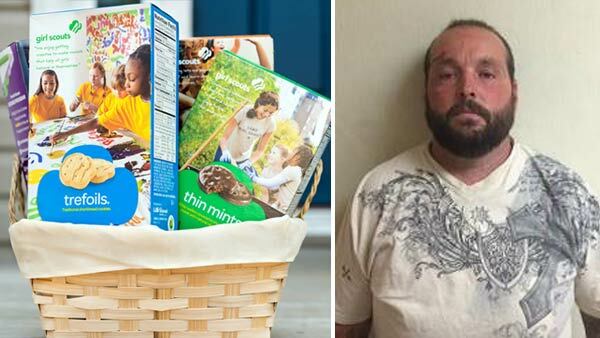 The sales representative of the Girl Scout cookies told police that the motorcyclist who just purchased the cookies could be identified. The sales representative tagged along with officers and accompanied them at the mobile home park where the man who had just purchased the cookies was identified. Police said 31-year-old Joseph Kopff was arrested for felony reckless evading and was later taken to the Riverside County Jail.